Bastet is an Egyptian goddess with the head of a cat. She was the goddess of perfume and ointment, which were very important for making mummies. 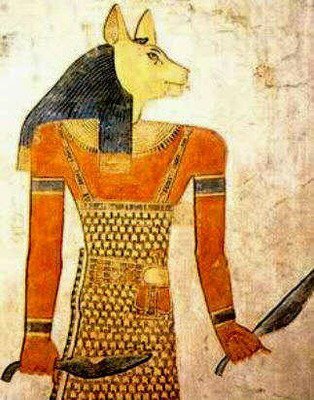 She was also the goddess of warfare depicted in early mythology as having the head of a lioness. Domesticated cats in ancient Egypt were regarded very highly for their ability to ward off rodents, pests, and snakes, and for being protective mothers to their kittens. Royal cats were dressed in jewels and allowed to eat off of their owner’s plates, which some cat owners encourage to this day. Bastet was later depicted as having the head of a domestic cat and lots of kittens. 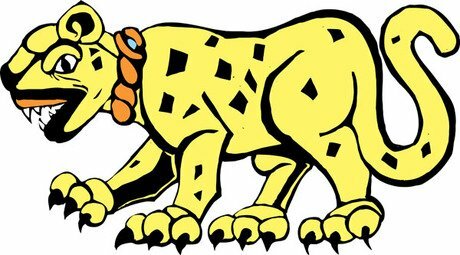 In addition to appearing as a jaguar, this deity is also the “night sun” that travels from west to east in the underworld at night, until it rises again in the daytime above ground. He also personifies the number seven, as well as having connections to fire and war. This may explain why your cat is always watching you at night while you are sleeping, with her big, glowing eyes, like the night sun. Dawon is a ferocious tigress given to the goddess Durga for her prowess in combat. 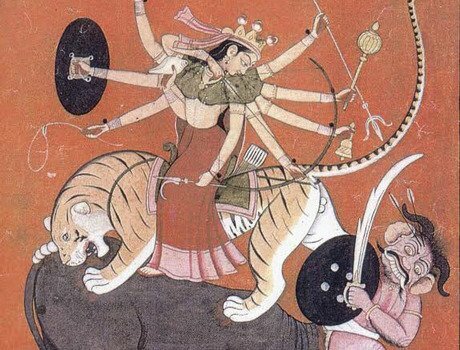 Durga would wield ten weapons in her ten arms and ride Dawon into battle like a horse. Dawon would use her claws and teeth to fight off enemies. Your house cat may not be able to carry you into battle these days, but you can’t hold ten weapons so you’re even. Dawon came to represent the victories of her mistress. Like the god Dawon, your modern cat can represent your many victories as well: like doing your taxes on time, composing the perfect Tweet, or cleaning out the litter box. 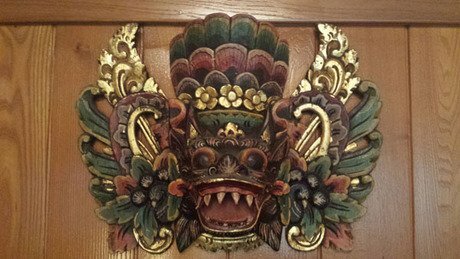 In Indonesia, Barong Ket is a lion leader of good spirits who fights the demon queen Rangda. He has a red head, thick white fur, is often accompanied by two monkeys, and is quite playful in times of peace. The story of his battle is still depicted in traditional dance, which you are welcome to act out with your own cat, so long as you don’t mind playing the part of a monkey. 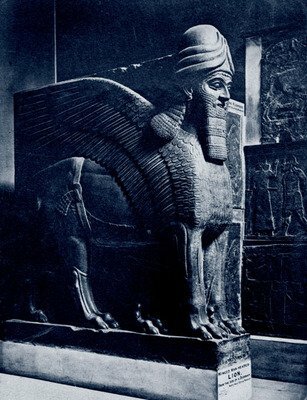 A Lamassu has a lion’s body, eagle’s wings, and a human head. In ancient Assyria, they were usually placed at entrances of cities or palaces as protective spirits. Statues were carved in such a way as to make them look like they were standing when viewed from the front and walking when viewed from the side. While it’s probably for the best that your cat doesn’t have wings or a creepy human head, she can still guard the entrance to your palace and keep bad spirits away. No matter which deity your cat may have descended from, she certainly deserve your respect, adoration, and warm cuddles. 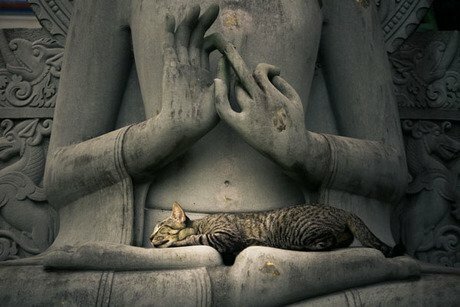 Cats are purrrfectly divine little beings just as they are.